Need for Madness Multiplayer - Development Blog! Updates on the latest developments in Need for Madness! We are currently working on creating an awards system for title holders of the clan wars world championship! Like the to interact with us and be in touch with all the updates! Or join the mailing list here to get notified of any major updates to occur in the game! 12/March/2015: A combination of updates! - The number of multiplayer turns for trial accounts has been lifted to 5 games per day! - The stage preview in the multiplayer room has been updated to preview custom stages in their colors and can also play their soundtracks. This will be helpful when previewing a stage in a multiplayer game before deciding to join it. It will also be helpful in selecting a stage from the weekly and monthly top 20 stages in the multiplayer room! - The "view stages" option in the player profile page is now functioning (finally). - For the players who are playing the game through Steam, now you purchase the multiplayer upgrade through Steam Wallet. The game had been removed from Steam’s store page because it was violating the terms of agreement. It was selling the multiplayer upgrade outside of the Steam Wallet which was a violation, we had no idea but we have now fixed this. We are in contact with Steam at the moment and are working towards making sure the game is in full compliance with the terms, hopefully we can get it back online soon. For now, those who have already downloaded the game through Steam will still be able to play it and get its updates fine. Hopefully this will help the game get even more attention for it to grow bigger. 22/January/2015: More Soundtrack Formats and Antialiasing! Game has just been updated with the ability to play more Module format types for its soundtracks, now it can play .xm and .s3m alongside the .mod formats! Game has also been update with an antialiasing option for the cars making them look smoother. Now there is an antialiasing checkbox present right next to the motion effects one, it is to toggle the antialiasing on and off. And finally the game has also had its interface graphics revamped a bit with a new logo and background images. 22/December/2014: Unlimited Account Cars and Stages! Our Christmas present to you this year is unlimited account cars and stages! The game has just been updated with ability for you to publish and add unlimited custom cars and stages to your account. Now whenever you see a car or stage you like you can just added it and not worry about how many cars or stages you already have, because you can have as much as you want! And whenever a new car or stage is added, it goes to the top of your account cars and stages list! Another option added is also the ability to re-do the last clan game played in a war or a battle. Improvements where made to the game's music player to play more MOD effects (thanks to Dany Fernández Díaz)! And some minor fixes have been made to improve the game's connectivity when displaying interactions/private messages. The game has just been updated with a championship for the clan wars! The championship is designed to be an ongoing one that never ends, where every clan has the opportunity to challenge, claim, defend and re-claim the championship title. Awards for the winners of the championship are still under construction and will be released in the coming updates soon. Enjoy the championship and good luck! 2/October/2014: Racing only, wasting only and Racers VS Wasters clan games! - Racing only - a clan can only win by racing. - Wasting only - a clan can only win by wasting. - Racers VS Wasters - one clan has to race and the other clan has to waste! We are exited about the "Racers VS Wasters" option because it would mean that one clan is just trying to run during the game, run and race as fast as possible while the other clan is just chasing them trying to stop them and waste them. It should make things more interesting and will definitely add more fun to the action for sure! The game has just been updated with a new stats monitoring system for the multiplayer. At the end of each multiplayer game the monitoring system displays who did the fastest lap, who was the deadliest waster and who did the best stunt during the game! This will definitely make the game more interesting as it displays a dimension in the multiplayer that was completely hidden before. 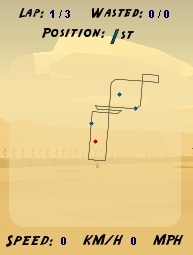 The game has been updated with a mini-map / radar that display the stage's race track course and the other car's locations in the stage. The map gets displayed on the top left corner of the screen and can be turned off and on using the [S] key. Just below the map a speed indication is also displayed which shows your car's speed in both Km/h and MPH. The real idea behind this radar map is to make it easier to waste and race on custom stages, when played for the first time in multiplayer. It will be helpful in wasting as it displays exactly where the other players are at in the race course and shows where they will be turning next and where they should end up. And it will be helpful in racing as it gives a pre-hint about the stage's race course turns that are coming ahead while driving. > Hopefully this will help make custom stages just as easily playable and as familiar as game stages! Fixes where made for MacOSX to stop some screen flickering that was occurring on some Mac versions. 14/August/2014: One month of free access! The game has been updated with the option to get one month of free access by posting online about it in effort to help it get more popular! If you need to upgrade or renew your account and can't pay for it, you can take advantage of this feature. 23/July/2014: Clan Members Online + Fixes! - The ability to see which members of a clan are online at any given time (through the clan's page). - Glitch fixes to the "Game News" part of the game to show more accurate interaction news. The game has just been updated with the biggest update to ever come to it at once! 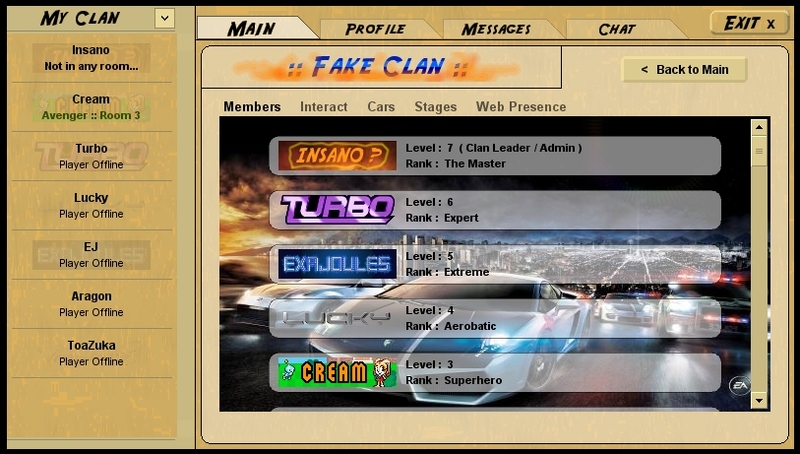 - The ability to add cars & stages to your clan, any member in a clan can add a car or stage as long as it was published by him/her, and only the clan's admins or the member that added the car or stage can remove it from the clan. A clan can have an unlimited number of cars & stages added to it! - The ability to have clan based conversations/interaction. Conversations between 2 clans, includes all members of both clans at once and single clan conversation for the members of one clan. These conversations are defined as "Interactions" in the game because through them you can also organize wars and battles not only have discussions. - War declaration, a clan can declare a war on another clan through the interactions and both clans get to predefine the stages & options of each game in the war. Once this is defined you can access theses predefined multiplayer games in practice mode to practice playing the war before it actually starts, which is specifically helpful if the war has clan based stages of the other clan you may not be familiar of! War consists of 9 games and the first clan to win 5 games wins the war! - Battle mode, similarly to the way wars are organized and started, you can also start a battle, a battles consists of 5 games and the first clan to win 3 games wins the battle. > However battles are played over clan cars or stages! There are 2 types of battles, a Car Battle and a Stage Battle! When you start a battle you choose a car or stage of the other clan to battle over, which your clan takes if you win and you also offer a car or stage of your clan to give if you lose. 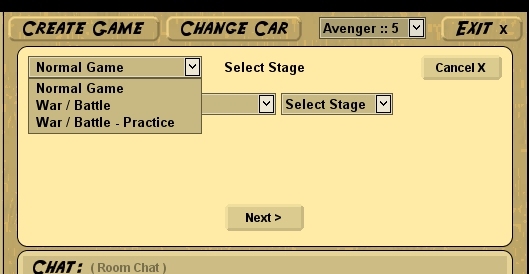 Once a clan car or stage is won by a clan it gets added to that clan and can only be used by that clan in the clan based games (clan based games only allow clan cars and clan stages for their customs). - Clan chat in the clan based games, a chat that only clan members whether watching or playing can access during a clan game! - The "Share a Relative Date" option, this is the most magical new option to come to the game, it is to help players organize wars and battles and meeting times accurately. It allows you to share a date and time that automatically gets converted to the local time of any person previewing it! The only thing to watch out for while using it is that your computers calendar and time be adjusted correctly, because the game uses it to define the date in your local time. - A "Game News" box has been add to the front page of the multiplayer dome, which shows who won against who in the last 5 recent clan wars or battles played, it also shows all clan related activity, all the actions that have been taken by the clan members and it also give a shout out to latest 4 players to join the game with full accounts, displaying them in case anyone is looking for new recruits! - The single player downloadable is now the same game as the multiplayer downloadable. There is now only one Need for Madness download which has everything! However if you already have the single player downloaded you do not need to re-download it, simply open it and it will automatically update itself to have the multiplayer as well! - And finally you can now additionally pay for a life time full account in Need for Madness where your account never expires, an account with permanent access for the avid Need for Madness players. You essentially purchase the game completely including all of its future updates to come. Welcome to the new era of Need for Madness Multiplayer! We have now finished all that is to be developed for the clans and their interaction, including chatting, clan cars, clan stages, battles, wars and more. We could release the update now but we would rather not as we are now working on a "news feed" that shows you everything that is happening in the game. We will release the update when the news feed part is complete so that everything is documented from the start. Please stand by and get ready for the biggest update to come to the game at once! The game has just been update with the Clans option! Now you can create an official Need for Madness clan to be able play clan based multiplayer games and multiplayer clan wars. This update is basically the ability to start a clan, organize players in it and have a funky looking clan page. A screen shot of a fake clan page is found bellow. The next update will be the ability for clans to interact with each other and organize clan games and wars. The update after that will be a "Clan Wars World Championship"! Setup and join your clan and get ready for a whole new level of Need for Madness action! 7/January/2014: Multiplayer Game Creation Notification! The game has just been update with a notifications system that lets you know whenever a new multiplayer game is created anywhere else in any server/room. Just a small update to kick off 2014's long line of updates planned! 20/December/2013: 8 Player Games, Unlimited Room Players and True Fullscreen Mode! - In preparation for the clan based games the multiplayer has been updated with the ability to have 8 player games. - You now can enter any room you please as there are no more "full rooms", a room can now have unlimited players as long as it has a limited amount of started games in it. - A true full screen mode that allows the game to take over the screen completely is now in place. - Also included in this update is an automatic self updater of the game so you do not need to download the game again when it is updated. 27/November/2013: Add Friends + More! - The "Add Friends" option of dome is now finished and is ready to be used! - You can now preview other players account cars in the game by clicking "View Cars" in their profile page. You can also view the profile of any player from the "Select your Car" page by clicking their name (any player that created a car that is being shown)! - A notification system has been placed in the game to let you know while playing the multiplayer if any new messages, friend requests or friend confirmations have arrived. - The weekly and monthly top 20 stages can now be accessed directly while creating a new multiplayer game in the room, this to show up the top 20 stages more and to be able to play on a top 20 stage directly without adding it to your account first. The game has just been updated with a private messaging system, now you can send private messages to other players throughout the game that work like email and instant chat at the same time! You can also share private or public custom made cars & stages through the messages as well. Update also includes connection improvements (1v1 glitch now fixed) with improved data reading of multiplayer packets to make the multiplayer work smoother! Now you can register a free trial account that allows you to play the multiplayer game online with no limitation (unlimited Multiplayer and LAN games per day). However you still need a full account to download the game to play it in application mode, to publish and use custom made cars & stages and to access all the features of the multiplayer dome! We will try this for one month, and then trial accounts might get limited to 5 games per day if the load on the servers gets too high, so please support the game and register your full account soon to keep this going! Today is the game's birthday (the date it was first released) and what better way to celebrate its birthday, then to release another major update to the game. Happy birthday Need for Madness Multiplayer! > The game has just been updated with multiplayer profiles! Now you can have your very own profile for your NFM persona in the game. You can add a logo image which would appear as your name in the multiplayer rooms and the dome. You also add an avatar image for your profile page, write some text about you and add a theme song for your self! The profile page also displays the number of multiplayer wins you made by racing versus wasting. A Multiplayer Dome has been added to the game, the dome is made to house all the new features to come in the multiplayer game. Through it you will be able to view player's profiles, edit your own profile, send private messages, start clans or join clans and much more... For now the features that are present is the Global Chat and Players Online. The "Global Chat" allows you to chat with all the players in the multiplayer in the different rooms/servers at once. 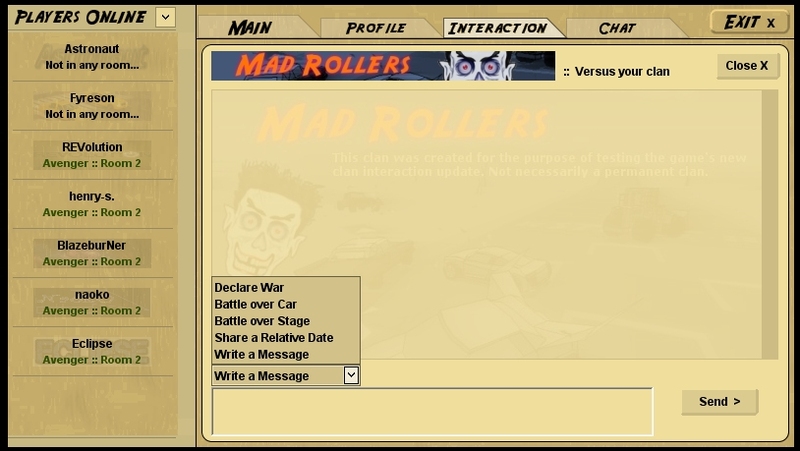 The "Players Online" option displays all the players online that are connected to the multiplayer. This hopefully will make things easier in finding your friends in the game and rallying to create clan wars or tournaments. Another feature added is small drop down menu button in the multiplayer room that allows you to jump from one room to the other within a server without exiting any room first. Also added are some improvements to the Car Makers 3D Edit display of the cars, displaying cars more smoothly and accurate! Need for Madness has been added on the Steam Community for Greenlight review! We will try releasing the Single-player version of game for free download there. - Create private games where only specific invited players are allowed to join! - Create games with a specified amount of car-fixes for each player, or no fixing at all! - Create games with no trees & piles present in the stage. 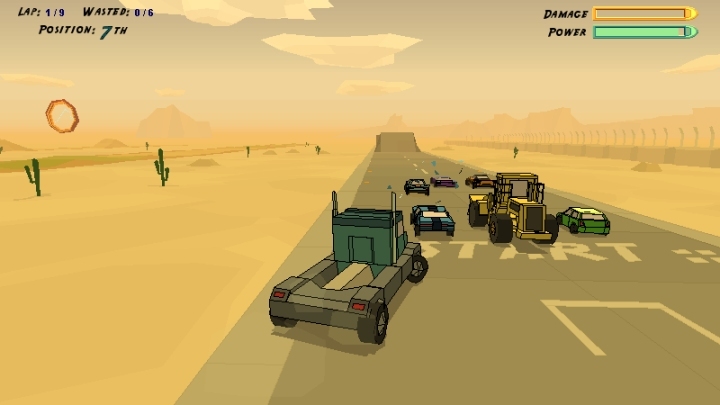 - Create games based on the type and class of the cars to use, on a broader scale. 13/June/2013: Server Upgrade & MacOSX Improvement! The game has just moved to faster more powerful server! 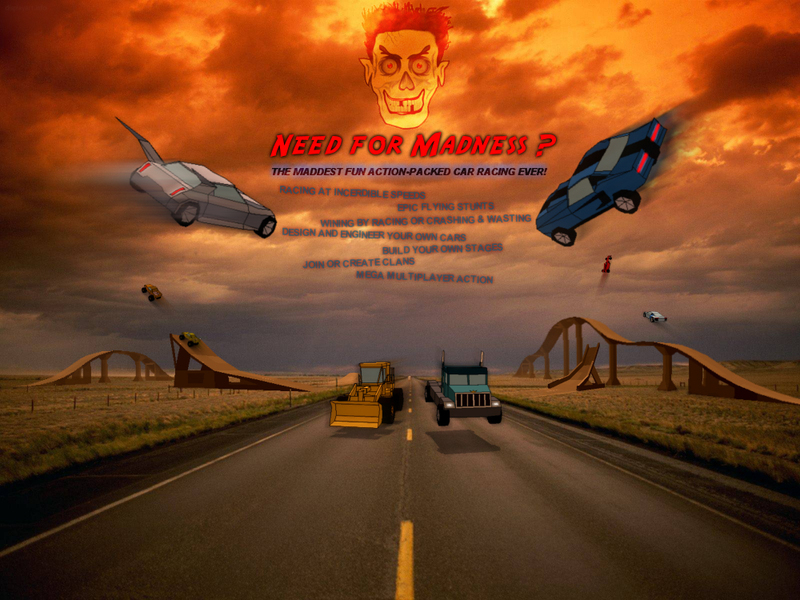 The game's main server Dominion has just been upgraded to a server 4 times more powerful (Dominion is also 'multiplayer.needformadness.com' which hosts the actual game, all the game files, your cars, stages and account information). Hopefully this will make things work faster and decrease the amount of lag & disconnection on Dominion. The version for Mac OS X has been update to a proper Mac application that works perfectly! 1/June/2013: NFM 1 & NFM 2 Modes! The game has just been update with an NFM 1 and NFM 2 mode of play! This mode of play is for the players that are new to the game for them to experience unlocking the cars and stages in playing NFM 1 & 2. The mode of play is also for whoever wants to play NFM 1 or NFM 2 with the new game graphics! Finally after a lot of hard work its here! The game's graphics update has just been released! Hope you all enjoy the game with its new graphics, as it still keeps it mad and cartoony look. We weren't able to finish everything we wanted to in this update, we were hoping to have more time to add an NFM1 & NFM2 Mode of play which would allow you to experience playing the single player game to unlock cars & stages with the new graphics, hopefully this will be with the next update. - The bad landing glitch that has eluded NFM since forever has now been fixed! - OP cars (over powered custom wasting cars) have been curbed down to not be as invincible and destructive as they have been (making the multiplayer game more fair), this without effecting normal custom cars. - Improvements to game's memory consumption have been made to let it not take up as much memory as it has, decreasing any game freezes that could have happened and getting it to run a bit smoother. - New decorative parts have been added to the stage maker which includes trees, cactus and ground piles. - The limitation on the number of parts in a stage has been doubled, to make room for the decorative stage parts and also give you the ability to make bigger stages with more parts! - A new tab has been added to the Stage Maker called "Scenery" which through it you can edit clouds and mountains for your stage! Much more has been made but the rest is visibly seen when playing the game! A new purchasing mechanism is now in place that allows you to buy account registration for someone else as a gift! Now you can buy a gift code that can be used to create a new account or renew the registration of an existing one. You can buy an account for someone or receive one yourself as a gift! 3/Febuary/2013: New Stage Parts + Multiplayer Stages! The game has just been updated with new stage parts for you to use in the Stage Maker. New parts include a flying roller coaster road which checkpoints can be attached to, new parts also include a tunnel like ramp that cars flip around in while driving forwards! Also created are five specially designed stages for the multiplayer game using the new stage parts! Other improvements and glitch fixes have also been made to game which includes improvements to the Stager Maker and its ability in laying the stage parts in the correct order on its own. More stage parts that are more decorative based have also been made but will be released in the game's next update, which will be the game graphics improvement and revamping! 22/December/2012: New stage parts on the way! 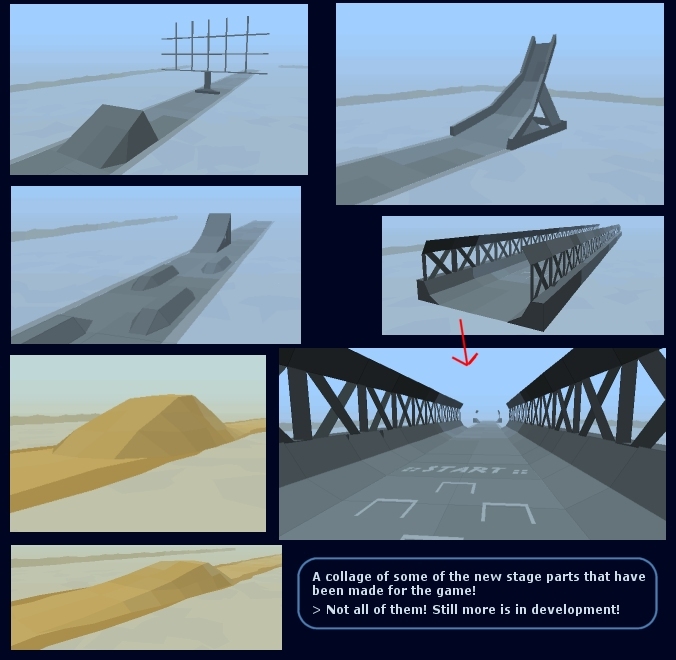 Here is a collage of some of the new stage parts created for the game. More parts have also been created and others are in the process, but we will surprise with what else has been created in the game's next updated! The next update of the game will have the new stage parts plus 5 new stages specially designed for the multiplayer game with the new parts. A new Top20 system is now in place that shows the more recent top published cars and stages! Now there is a weekly, a monthly and an all time Top20 list. The top published cars and stages are detriment by how many players have added them to their account. Other improvements have also been made to the game to make it work faster and smoother (will be most noticed by players with slower computers)! The maddest game in the world has just been taken to whole new level of madness! You can now publish your created stages to your account and into the multiplayer game through the Stage Maker. You can also add other created stages by other players to your account. There are no more limits to amount and type of stages that can be played in the game, you make it! The game has been updated with the option to edit your account details. It can be helpful if you want to change your Nickname/Password at anytime. Through this option you can also view details about your account registration and renew your subscription. The option is found right underneath the "Logout" button found in the multiplayer panel of the game, when you login. There was a glitch in the Stage Maker which caused the Checkpoint order of some stages to be incorrect, this has now been fixed! Now the Stage Maker is cleverer in defining the Checkpoint order automatically on its own. 13/August/2012: Stage Maker - Complete! Finally after a lot of hard work the Stage Maker has been complete and released! It has been developed to be a very easy program to use that can create stages really quickly, now you can create any stage you imagine! The Stage Maker is available with the downloadable game. Download the multiplayer or the singleplayer version of the game to get it. The publishing feature of the Stage Maker which will allow you to use your stages in the multiplayer game is still being developed but it will be finished very soon hopefully. 27/June/2012: Stage Maker - Sneak Peak! A quick screen shot to show you what the stage maker looks like so far. The hard part of it is over and the rest of its development should get accelerated now! > Join the mailing list to be the first that knows of any major update to occur in the game! An updated for Mac OS X! The playback sound quality of the music has been improved dramatically for Mac (now it's the same as in Windows). If you are playing the game on a Mac and had downloaded the game before this date (17th May), download the game again to get the improvement. This is not a major Need for Madness update so the game will not automatically ask to be updated about it. The update is available in both the Singleplayer and Multiplayer download. The game has now been update with the Top 20 Lists that show the most added public cars created by the players. The lists are based on the car class. Browse the top 20s to add any car you like to your account to play with it! 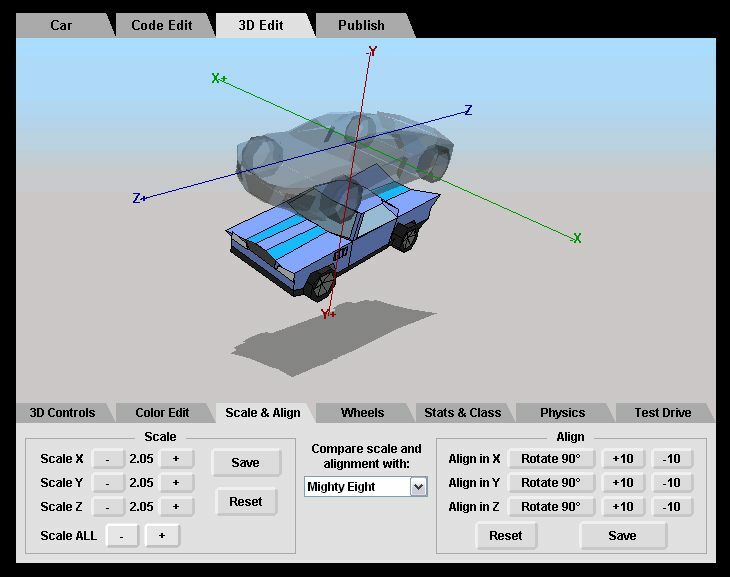 The game's Car Maker has also been updated with the Import external 3D models option. 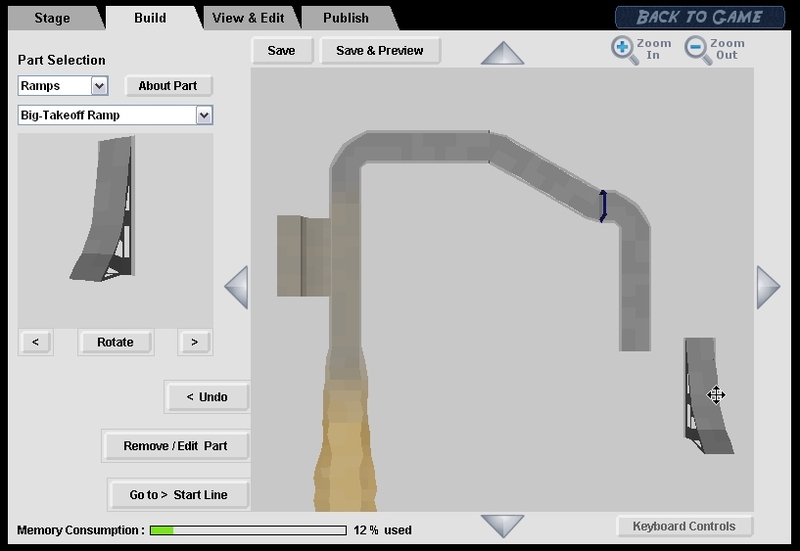 Now you can use other 3D programs to create your car then import it into the Car Maker to add it to the game! 3/May/2012: Car Maker Homepage & Forums! The Car Maker's homepage has been created, ready for all your car making needs. It includes the official Car Maker forums which are dedicated to car making! It also includes links to other related external sites and forums. The page will still be updated with more car making information and tutorials. It will also serve as the Stage Maker's homepage in the future, when the Stage Maker is complete. 19/April/2012: Fixes + New Option! There was a glitch in the game causing it to lag a bit when switching between the Car Maker and the Game a few times, this has now been fixed and the game should work a lot smoother. Other modifications have been made to the Car Maker so that it does not create or publish cars with overly sized wheels and other errors. "Game Cars Only", which creates a multiplayer game for original game cars only and with no custom Car Maker cars allowed (an option for those who want to play the game as the original). 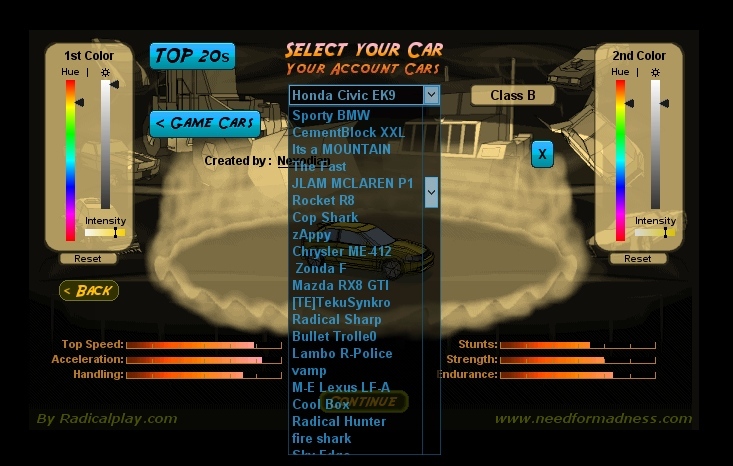 The option can be found in the drop down menu for choosing the "Car Class" of the multiplayer game as you create it. 11/April/2012: Car Publishing + Editable Laps! Need for Madness has just been taken to another level! Now you can publish your created cars through the Car Maker to your account and into the multiplayer game! You can also add other created cars by other users to your account to play with them! Whether to publish or to add cars in the multiplayer you will need a Need for Madness account to do so, if you haven't registered yet, register now here! Not registered but want to download the Car Maker to make your own cars anway? The Car Maker is included in the single player game! Another update to the multiplayer has also been added which is the ability to change the default number of laps for any stage as you create a multiplayer game! Finally after a lot of hard work the Car Maker is finished and has been released! The Car Maker is included in both the multiplayer and the single player downloadable version of the game. 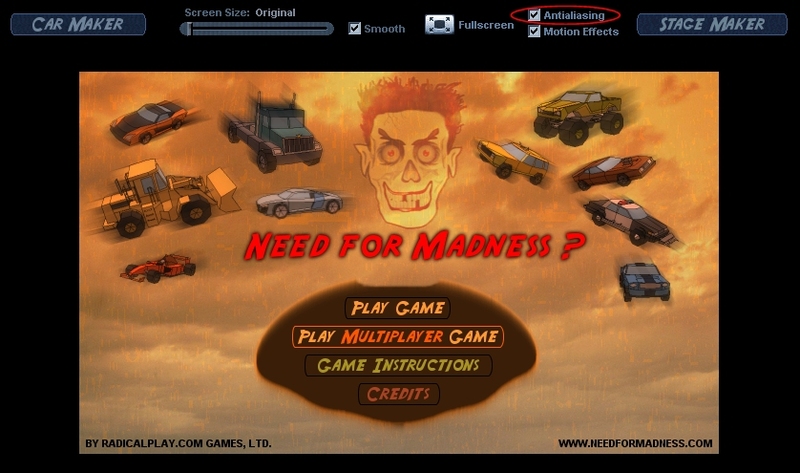 Now you can create your own Need for Madness cars! However it is very important to follow the Car Maker tutorial at first to learn how to make cars correctly. The publishing feature of the Car Maker is still being developed but it will be finished very soon hopefully. Other updates to the game include not counting the disconnected games out of the 5 allowed games per day for non-registered users. Also some of the rare lag in the game which caused it to freeze slightly for some users has now been fixed! An update is to let you know that work on the Car Maker is going great and it will hopefully be worth the time spent developing it! The car maker will be available for everyone to use as well as the offline single player downloadable version of the game. But to publish your created cars and play with them in multiplayer and download the multiplayer you will need to register an account! For those of you, who haven't registered yet, please do soon! - The cars have been classified into different classes in order to be able to create multiplayer games based on a car class! 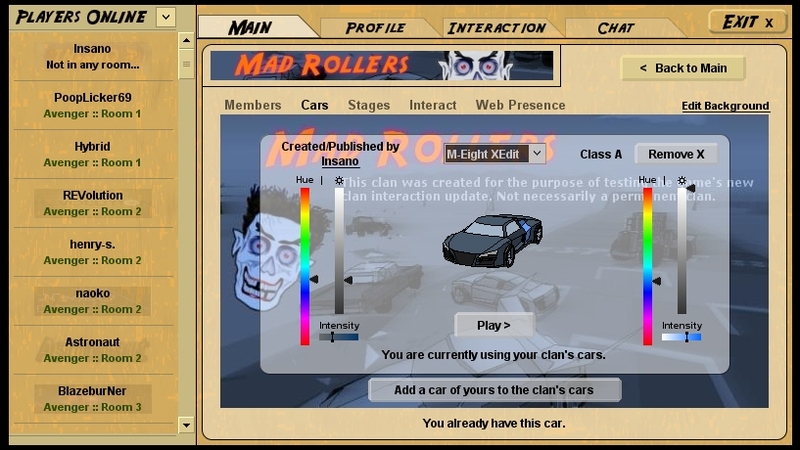 - Also an option to create multiplayer games based on a single type of car has been provided! - An "Intensity" adjustment option in coloring cars has been added (now you can fully edit the color of your car with no "saturation limitation")! - The Downloadble version of the game has been released. Now you can download the game and play it from your PC in the faster application form where it has an adjustable screen size option! Price of registration has now gone up from $10/year to $11/year. - A glitch that was causing LAN games to occasionally not start has now been fixed. - Sound effects playability has been fixed for Mac OS X (for some Mac versions sound effects where not being herd, this is now fixed, still need to fix the quality of the music playback in Mac though). - Other technical updates have been made to game to make it work smoother as well. 5/October/2011: LAN Bots and a Fix! - LAN Bots have been added to the LAN multiplayer mode! Now when you play a LAN game you can add computer driven cars in the game with you! - Also another glitch has been fixed! This glitch happened when watching a game, it made cars appear wasted (on fire) when they really weren't. 29/September/2011: New Features and Fixes! - A "Change Car" button has been added in the multiplayer room. So you don't have to exit your room/server to change your car. - During a multiplayer game, when you click [A] to make arrow point to cars, now you will be able to see ALL cars in the game and their damage status (not only the first 3). - Fixed problems with chat filter, which was treating some normal words as curse words. A new option added which grants the ability to remove the Fixing Hoops from any stage in a multiplayer game! The No Fixing option! The person creating a new multiplayer game can now choose to have the stage with no Fix Hoops available. * MASHEEN was getting prematurely wasted (considering it's MASHEEN). This is now fixed and you should be able to play with a MASHEEN performing correctly now! * Fixed game watching error which was occurring when trying to watch a 7 player multiplayer game. Try out more games at CrazyGames.com!